Maybe it’s much too early in the day but I guess I’ll ask you just the same – HAVE YOU FINISHED SHOPPING YET?!?!?! OMG I have a house full of people coming and I need to make sure I have enough food to feed them all for a week in case we are all snowed in within the 5h of the party. Or at least, that’s how I feel. First I bulk up on sweets then I realise I have to feed people some decent food and I bulk-buy mini food. I could feed a small army on what I buy for parties I throw. Needless to say I don’t throw them often. Morrisons Pedro Ximénez – well, everyone talks about this so I thought I’d best serve it at a party. I hope it tastes good as I’ll be trying it for the first time at the party. Yes I should have opened it to review it but I didn’t want it to go off. Does it go off? Aldi Cremant de Jura – This is one of my go-to bottles of bubbly. I reviewed it years ago and have been using it ever since. Maynard’s 10 Year Old Tawny Port – Oak casked with aromas of dried fruits, a delicate nuttiness, honey and a hint of caramel. You have to have port and I prefer a tawny to a ruby for sure. 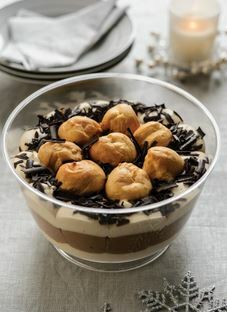 Morrisons Irish Cream Profiterole Dream – Velvety layers of Irish cream and Belgian dark chocolate mousse and custard, topped with chocolate sauce and Irish cream profiteroles – YUMMY and irresistible. 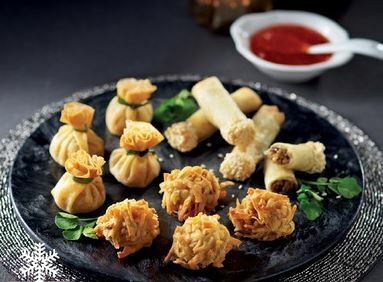 Aldi 12 Mini Canapes – filled Green Thai or Red Thai chicken tartlets. 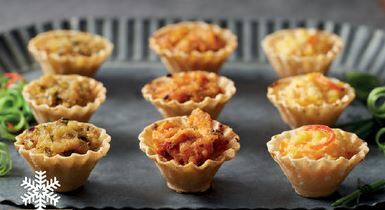 I love these bites of deliciousness but the green ones are really my favourites! 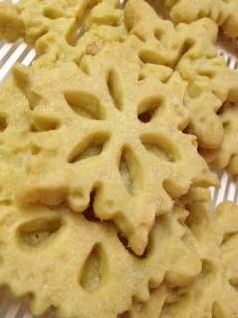 On top of this I’m going to be baking shortbread snowflake cookies and making fudge! 6 Responses to What Are you Eating & Drinking New Years Eve? I am eating gougères and drinking something called Champagne Eve des Rêves (Rosé) bought at the fabulous Plaisirs du Vin in Boé near Agen. Highly recommend the snacks, the bubbles and the store 🙂 Happy 2015! You have a great selection here, it’s making me quite peckish! I’m cooking a nice fillet steak and we’re sharing a bottle of Bollinger. It’s enough food to feed an army of dwarves at mine! Good morning and happy new year! 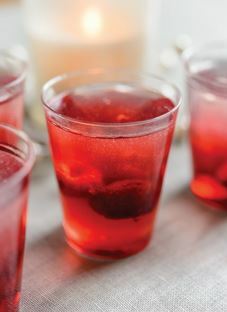 Wish I’d been in closer proximity to those jelly shots last night, although that said my head feels as clear as the shiny new pages in my diary so maybe I don’t!